By Queen. Arranged by Chris Peterson. Barbershop Harmony Society. A Cappella, Barbershop, Rockabilly, Pop. Octavo. 8 pages. Published by Barbershop Harmony Society (HL.8750082). 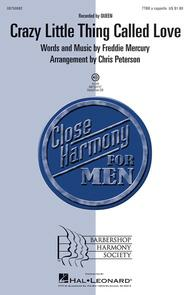 Your singers and audiences will love this barbershop arrangement with a bit of doo-wop flair! The #1 pop hit of 1980 by Queen will be a knock-out in performance! Available separately: TTBB a cappella, VoiceTrax CD. Duration: ca. 2:00.